CAVE CREEK – For fourteen years Big Bronco has been fun, fabulous, funky and a favorite amongst locals and out-of-towners who want to incorporate a touch of western flair into their homes. 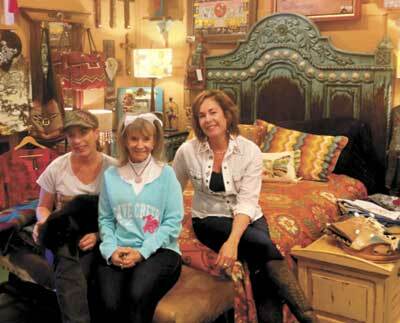 Recently, owner Faith Weinberg remodeled to focus on the feminine side of Big Bronco furnishings and fashion. “We’ve created a cowgirl room,” explained Weinberg. The cowgirl room is a little more girlie and features a gorgeous turquoise headboard and nightstand. (You might even find “mascat” Bronco sleeping on the bed pillows.) Positioned throughout are tees and blinged-out shirts, handbags and countless other accessories – ideal as gifts or for your own special self. You can count on Big Bronco being steadfast in its outstanding customer service, but know outside of its we-are-here-for-our-clients promise, the store is ever-evolving. Weinberg and her staff are on top of trending colors and styles and are always introducing new (that may even look antique!) merchandise. She added that folks love to update their homes’ looks with pillows. “We have all price points in southwestern colors and materials – leather, suede, cowhide with fur, fringes, studs, beads.” Weinberg even found (from Patricia Wolf out of Texas) a multipurpose fringed shawl that can be used by day draped on the back of a chair but can be worn over the shoulders for a night out on the town. They are hand painted and intricately crafted are true works of art. The end of April, Weinberg hosts her end-of-season sale, so stop in at Big Bronco and take home something – furniture, fashions, accessories, blankets, candles, kitchenware, artwork – that says a little bit of Cave Creek fab resides in you. Neighbors, friends, coworkers will no doubt want to know “Where did you get that?” when they see your latest find. Plus, a portion of the weekend sales benefits two horse rescues – Triple R Horse Rescue and AZ Equine Rescue. Stop in at Big Bronco, 6620 E. Cave Creek Rd. For details, visit bigbroncocavecreek.com, phone the furniture barn at 480-575-1357 or the general store at 480-575-7025.